The Growth of Crystals series was begun in 1957 by A. V. Shubnikov and . N. N. SheftaP with the publication of the first volume. which contained the proceedings of the First All-Union Conference on Crystal Growth. The initiative and considerable efforts of the principal editor of the entire series. N. N. Sheftal', and his assistants led over the next 15 years to the publica- tion of ten volumes wh… ich have assumed a leading position among the numerous books on crys- tal growth. 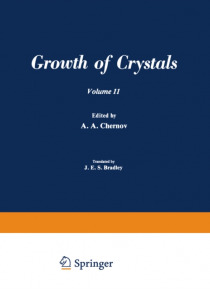 It has become traditional in this series to adopt a broad approach to crystal growth problems, and this approach is continued in Volumes 11 and 12, which are composed mainly of papers presented at the Fourth All-Union Conference on Crystal Growth in Tsakhkadzor. September 17-22, 1972. These papers, presented by both Soviet and foreign workers, deal with crystal growth processes. growth methods. and crystal perfection. Many of the papers reflect the tendency for our knowledge of crystallization processes to become increasingly more fundamental. with emphaSis on quantitative treatments. There are some extremely difficult problems in this approach. especially when the requirements of practical uses are envisaged. and many of these are discussed in various ways in these two volumes. These topics include detailed theoretical and experimental analysis of cooperative phenomena in crystallization. with emphasis not only on statistical thermodynamics but also statistical kinetics. This approach involves research on the structure and properties of phase boundaries. including the composition and structure of surface layers in liquids.